Last time we looked at some new chords you can throw into your 12-bar blues rhythms to spice up the sound. This lesson we will be looking at turnarounds. A turnaround is something that typically happens over the last 2 bars of the progression or sometimes even over all four of the final bars. In some instances, the turnaround is even used to introduce the track, Eric Clapton’s Before You Accuse Me being a great example of this. 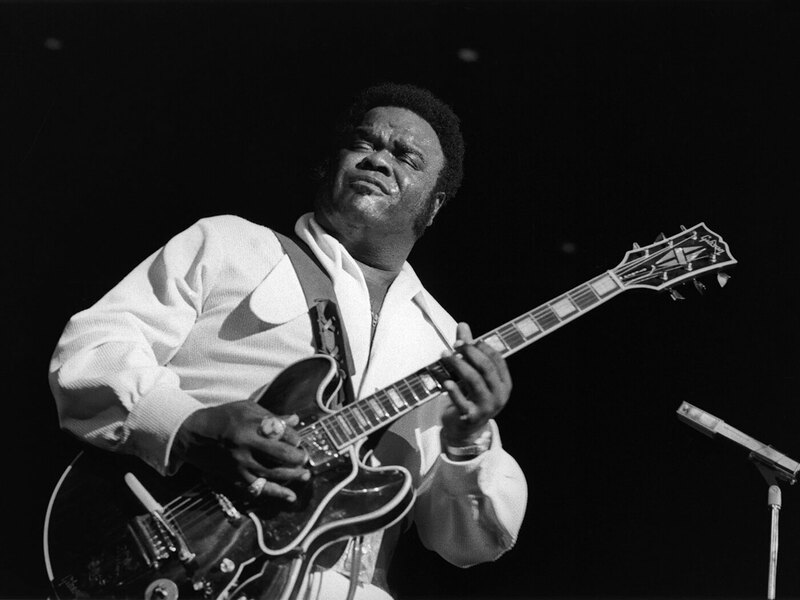 This is a staple of blues music and even if you are not familiar with the terminology, you will certainly know the sound of a turnaround. The name of this phrase has a very literal meaning, in that you are “turning around” the repeated rhythmic pattern back to the first chord with a slight melodic variation. A turnaround in blues is a great way to add some depth to the rhythm parts and is also used as a way to end the song. One of the most common traits you will hear in a blues turnaround is a chromatically descending run that stems through part of the turnaround. 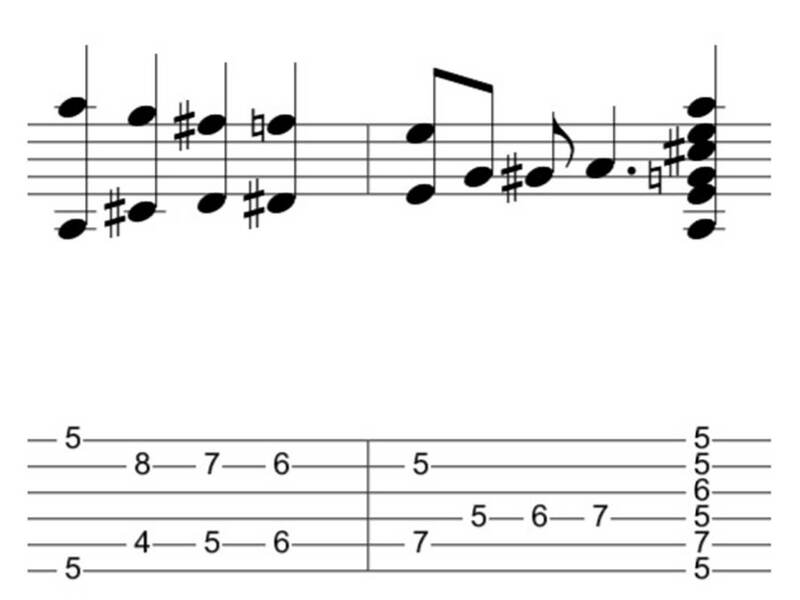 This example has the chromatic descending note on the D string while the 9th fret on the G is played against each changing note. 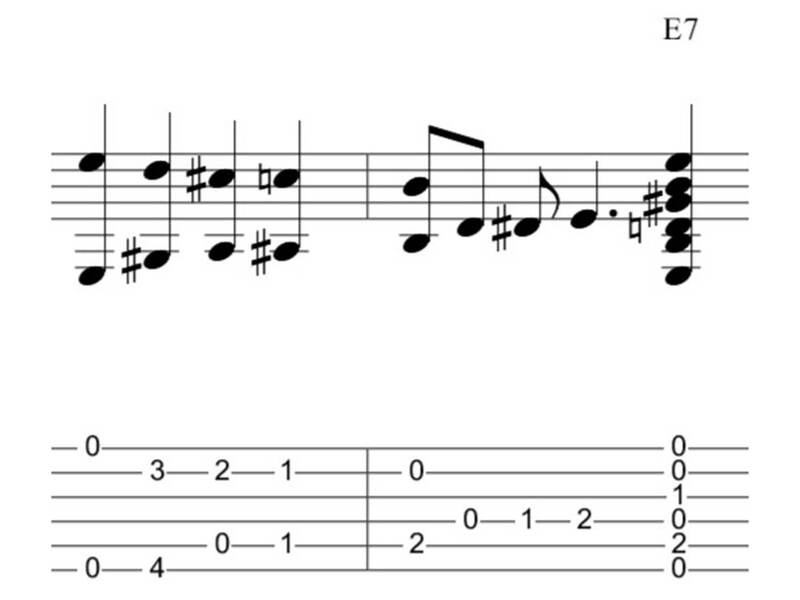 This turnaround is very typical of something you might hear an acoustic blues player add into their 12-bar blues. We are taking a chord shape and moving it down through four chromatic notes. This follows the same chromatic rule as the previous turnaround except the whole shape moves. The final shape is played as three open strings followed by a hammer on and pull off on the 1st fret of the G string. This is made up of 8th note triplets so you’re aiming for three notes per beat. 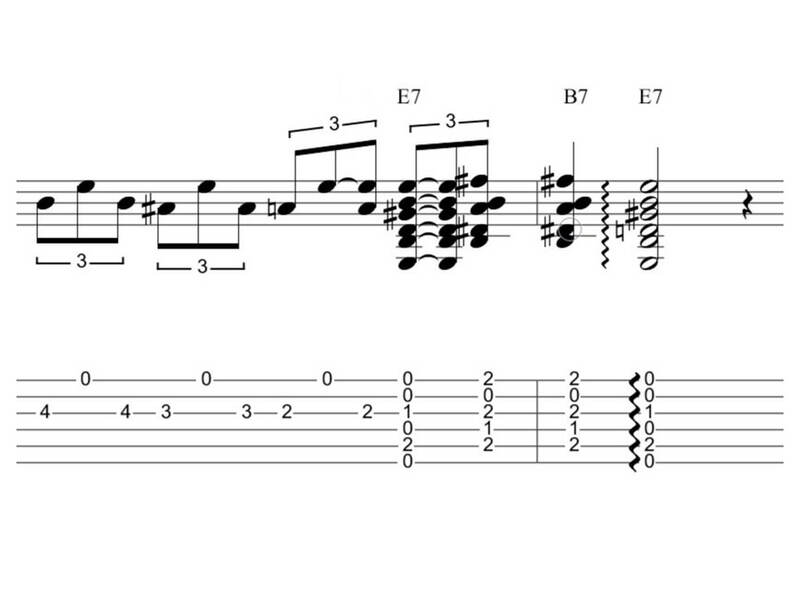 Blues turnarounds can also take the form of a lead guitar run. 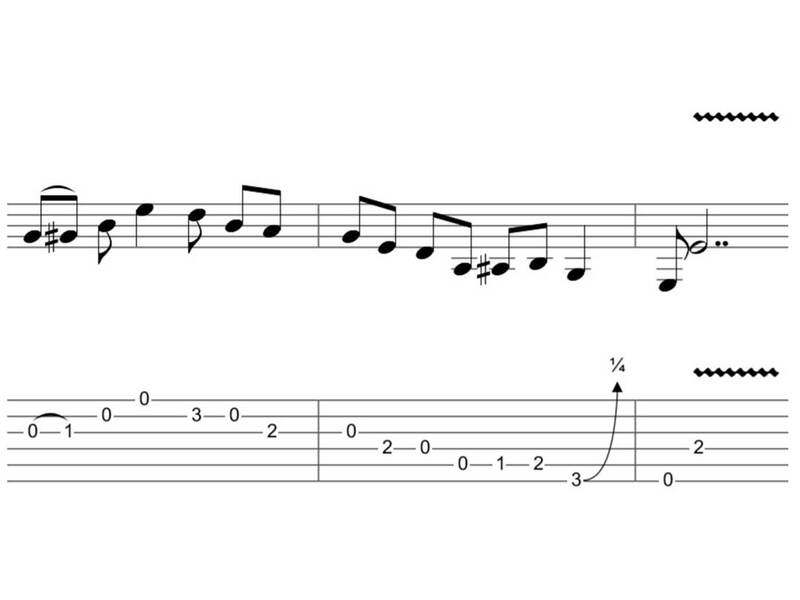 Here is a simple pentatonic run using the E minor pentatonic scale in the open position. 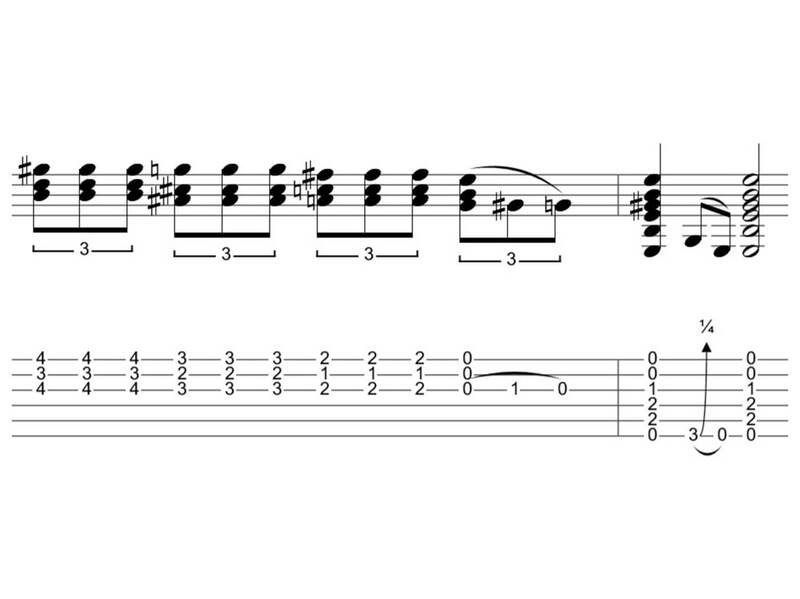 There are 2 notes here which are outside of the scale (We will cover this in more depth in a future lesson). The 1st fret on the A string (The b5 interval) and the 1st fret on the G string (The b4 interval) are both outside notes that can add a bluesy flavour to a scale. 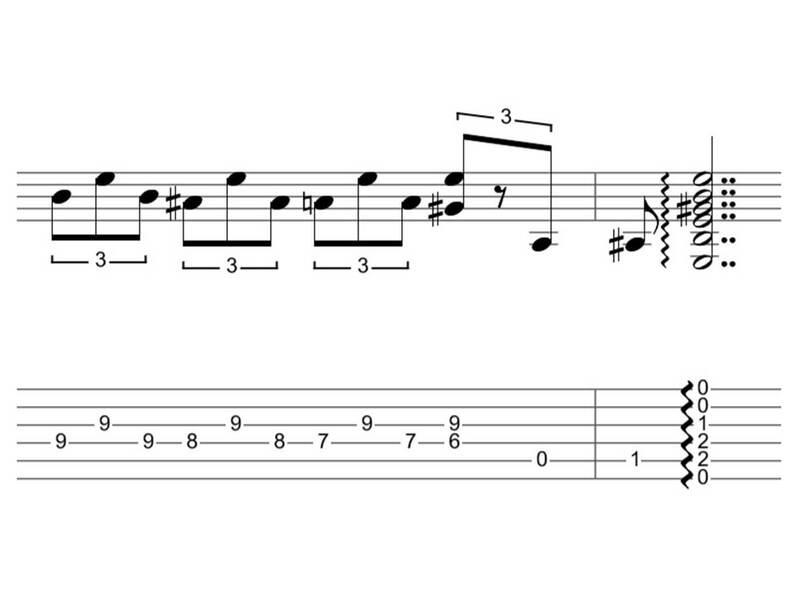 This run starts with a hammer on followed by two open strings. The lick then runs through the scale backwards, except when you reach the A string, you reverse the flow and play the notes ascending. The final bar ends with a jump from the open Low E string to the 2nd fret of the D string, which is an octave of the E string. Here is another chromatic descending turnaround, the chromatic notes are on the G string starting from the 4th fret and alternate between the open E string. We have also integrated some chords into this turnaround in the form of an E7 and B7. The first bar is made up entirely of 8th note triplets, but the fourth beat is made of chords. The E7 chord takes up two thirds of the triplet and the B7 takes up the final triplet beat. This turnaround is using a concept called contrapuntal motion. Contrapuntal motion is two separate melodic lines moving in opposite directions at the same time. If you look at the low and high notes in this example, the notes on the wound strings are ascending and the notes on the unwound strings are descending. This style of turnaround is great to add a melodic complexity to the end of your blues progressions. To make this flow, visualise each two-note group as a separate chord shape so your hand will re-form for each note. Start off slow to get the finger patterns and the flow tight. This turnaround is the same as Ex5 but due to the nature of the shape of this turnaround, it is an easy one to transpose into different keys. The only noticeable difference is the shape of the second chord. This is due to the low note in the second chord, in an open position this note would fall lower than the open string. When you play this in a higher register you can stick to the shapes here. When playing through your 12-bar patterns in various keys, try to integrate some of these turnaround ideas over the last 2 bars or at the end of an entire song worth. All these turnarounds can be used to simply “turn around” the progression back to the I chord or end a piece. For using turnarounds to end a piece, slowing down over the course of the turnaround is one great way to finish or, if the turnaround resolves at the root chord, allow a pause before hitting the root chord one final time. In the next lesson we will take a look at some slow blues progressions using these chords and explore various rhythms and techniques we can apply to make our 12 bar really capture the mood we want. If you have enjoyed this lesson and you’re looking for a guitar teacher in your local area check out our guitar lessons page and speak to one of our highly recommended teachers in your local area. If you are based in the Leeds area check out our Guitar Lessons Leeds page.